The story of Laura Codron by Noah Botman, June 2010. There are few places on earth more beautiful than the island of Rhodes. This sacred island of the Greek god Helios is overflowing in ancient sights and bathed in glorious sunlight. The serene feeling of the warm Mediterranean on your feet and the vibrant cloak of colours surrounding you add every aspect of bliss to this island Shangri-La. For over 400 years a Jewish community thrived here. On July 19th 1944, 1900 Jews were deported to Auschwitz. Among them was a 17 year old girl named Laura Codron. 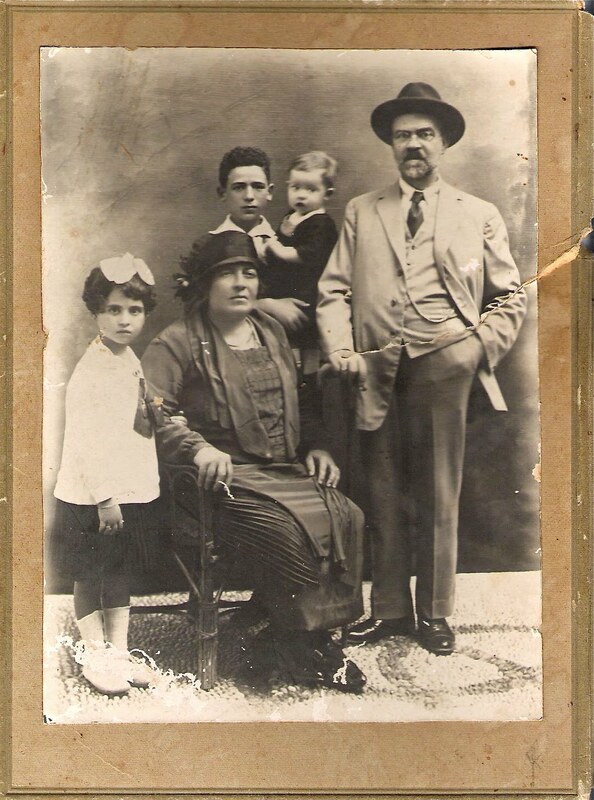 Above: Photo of Laura’s grand parents, Papou Mousani and Granny Rivca Codron. 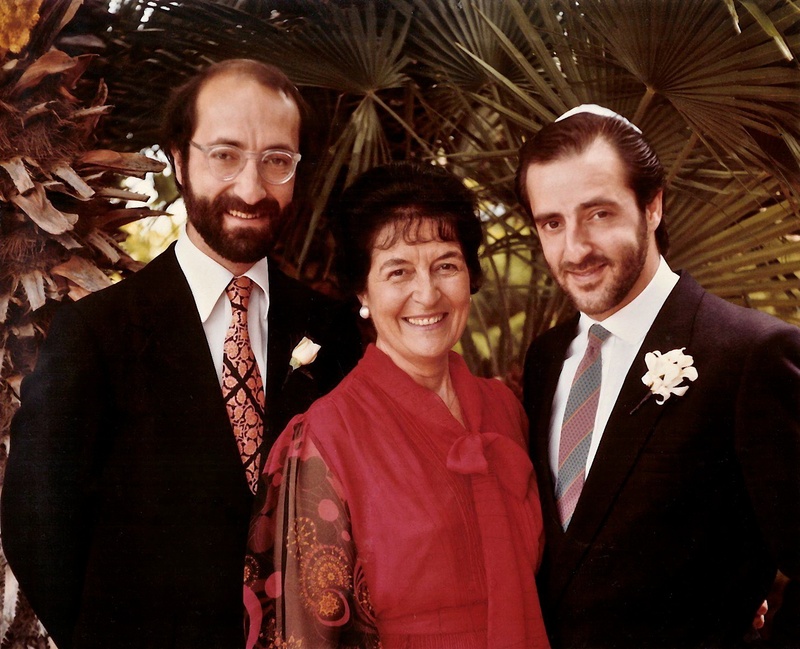 According to Laura, to the left is her cousin Perla Levi, and at the back, her uncle, Isidore Sonsol, holding Laura’s brother Maurice. Laura’s parents, brother and sister were all killed in Nazi Germany concentration camps. 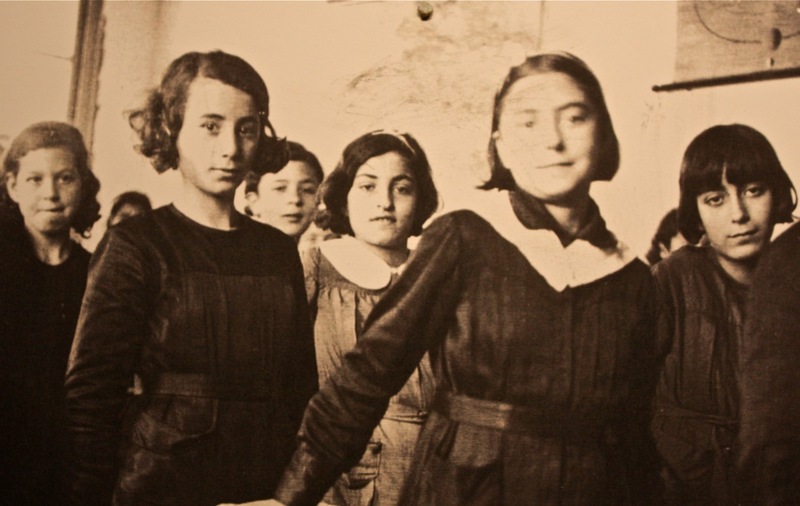 Young Jewish girls from Rodos before the war. 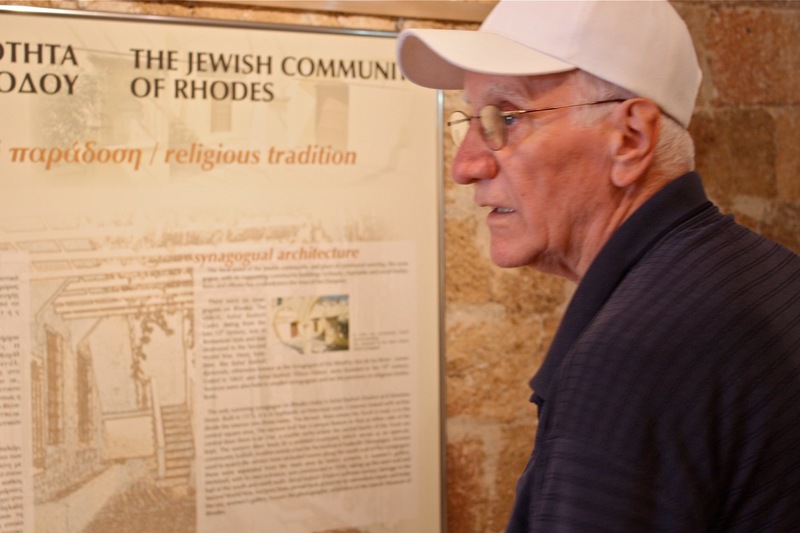 Only 151 Rodos Jews survived the Nazi camps – out of a population of about 1900. Laura Codron is the first cousin of my maternal grandmother, and I had the experience of learning of her story last summer, when my family and I decided to retrace our roots to Greece, Israel and Turkey. On our last day on Rhodes, my grandmother took me to the Jewish cemetery, where she showed me the tombstone of her grandmother. 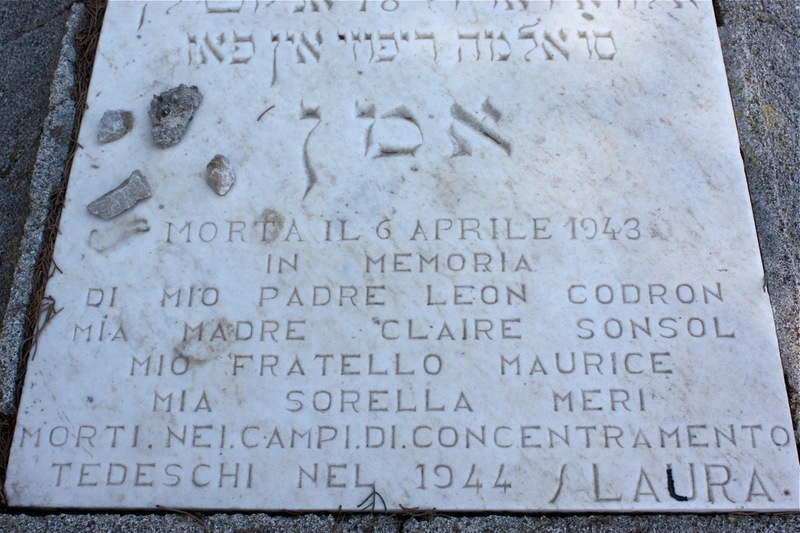 On the tombstone, there was an additional inscription, written in Italian. It turns out that after the war, Laura returned and engraved a message on her grandmother’s tombstone, to commemorate the deaths of her parents, sister, and brother. 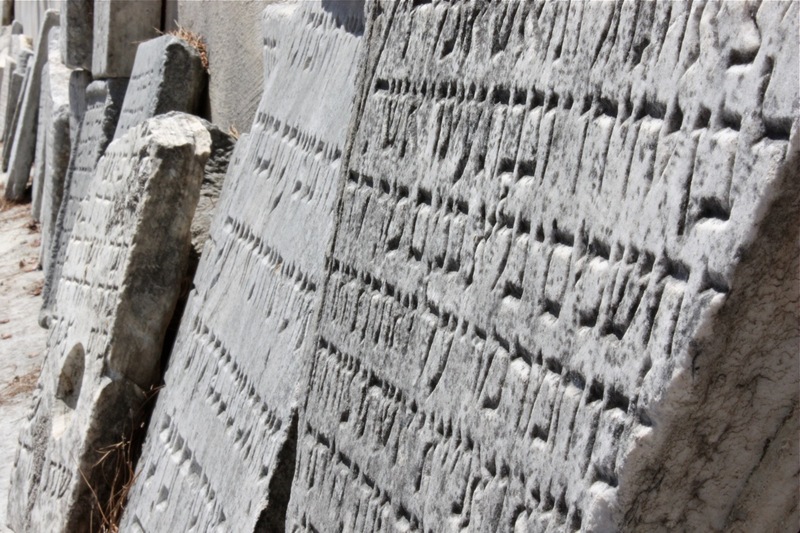 The incredible part is that, even though there are hardly any Jews left in Rhodes, that tombstone will hopefully last for millennia. Ironically, the tombstone is the written proof of Laura’s survival. It is her testimony. Left: Norman Amato, Jewish museum, Rodos (July 2009). In July 1943, the Nazis occupied Rhodes Island. Even though Mussolini had four times as many troops on Rhodes Island than the Nazis, he nevertheless inexplicably surrendered. A year later, on July 19th, 1944, the Nazis in control of Rhodes Island ordered all of the Jews to gather enough supplies to last for 10 days and told them that they were “being transported to the safety of a nearby island.” There were 1940 Jews among the community, but only 1900 were taken. This is because of the brave actions of the Turkish ambassador on Rhodes Island. He persuaded an SS officer to release 40 of the Jews in the community because they had Turkish passports. The rest (including Laura) were boarded onto three small freight ships, headed to Auschwitz. Only 151 eventually survived their final destination, the death camps of Europe. Laura went through and survived Auschwitz, Dachau, and Bergen belzen. 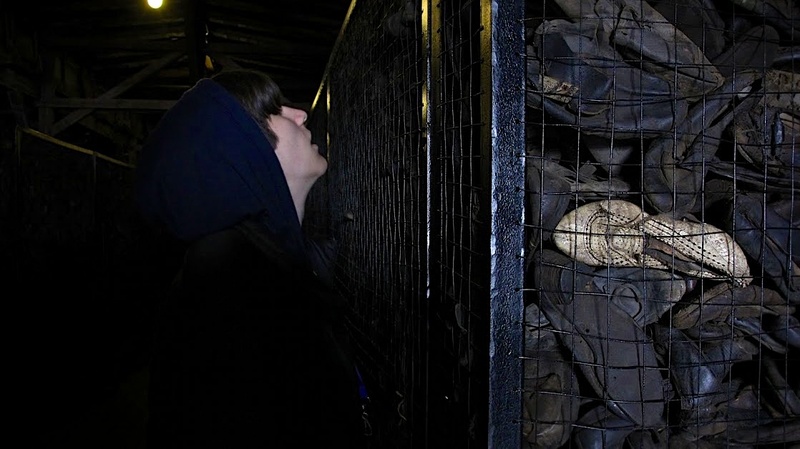 Laura doesn’t talk much about what she actually went through in the concentration camps. She remembers being very hungry. 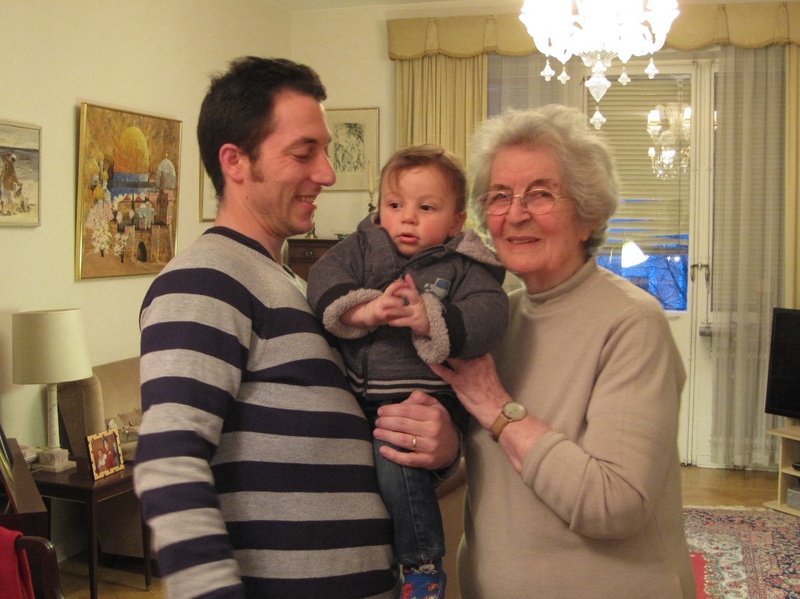 When she was liberated, the Red Cross took her to Sweden, where she met her future husband. The most vivid memory she has of that time is of the white Swedish bread loafs she was offered when she first arrived. Today Laura lives in Sweden. Her children and grandchildren live in Israel and the US. About 50% of the Jews in Sweden are descendants of holocaust survivors. Above: Ketty Amato, (née Codron, cousin of Laura) Noah and Lindy (July 2009). Left: “In memory of my father Leon Codron, my mother Claire Sonsol, my brother Maurice and my sister Meri, killed in the German concentration camps in 1944.” To some this phrase is unnecessary and unimportant. However, these words have a profound effect on me, and hopefully on you. I have learnt from Laura of all of the hardships she endured. She survived the harshest “where and when” in the entire modern world, and came out without a family. If I am ever in a situation in which I must share about family members in the holocaust, I will be the first to jump up and begin to tell Laura’s story. There is very little that is more inspiring than the testimony of those who survived the holocaust. Laura’s testimony has inspired me to do as much as possible. Everybody who knows about the holocaust must do three things: They must never treat another race differently, in the way the Nazis did; they must disclose holocaust deniers everywhere; and they must never forget the atrocities done by man against man. If we forget, it will happen again, and six million people will have had their lives destroyed for no reason. 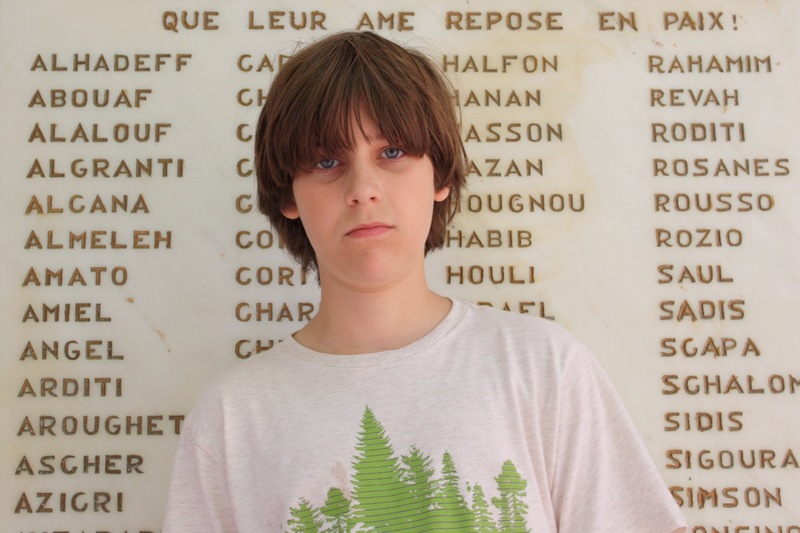 Left: Noah, in front of the memorial for the hundreds of Jews from Rodos who died in the Nazi camps – including Noah’s ancestors, the Amato, Codron, Hasson families and many more. (July 2009). In April 2013, Noah had the privilege of participating in The March of the Living. He traveled to Poland and Israel and marched proudly in the memory of Laura and all the Jews of Rodos who perished in the concentrations camps. Below, two photographs of Laura and family members added in March 2013. In May 2018, Noah travelled to Israel on Birthright. He visited Yad Vashem with his cousin Adam Leibowich. 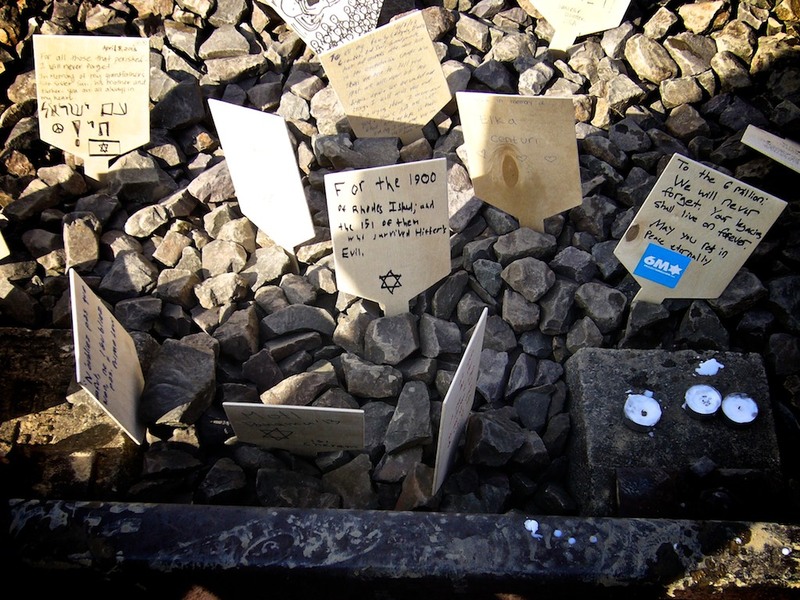 As he did in 2013 when visiting Poland while on the March of the Living, he left a note in honour of his grandmother’s cousin, Laura Codron, whose family members all perished in Auschwitz at the hands of the Nazis. Noah Botman with his cousin Adam Leibowich, Yad Vashem, Israel, May 14, 2018. Note left by Noah Botman in the Yad Vashem memory book in honour of Leon Codron, Claire Sonsol, Maurice Codron and Meri Codron (father, mother, brother and sister of Laura Codron who all died in Auschwitz at the hands of the Nazis). “I am Noah Botman. I am here for Leon, Claire, Maurice and Meri Codron, who died. And, I am here for Laura Codron, who lived.” May 14, 2018. 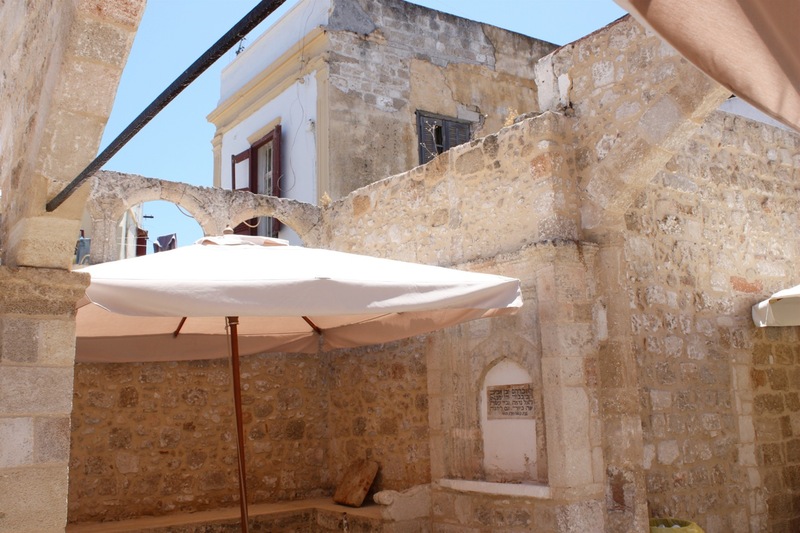 For additional pictures of our trip to Rodos, Turkey and Israel, please click on the link below and then click on the desired gallery (Rodos 2009, Israel 2009, etc.). For privacy reason, there is a password to access the pictures. The password is the city where Lindy was born. Michel Botman was born in Belgium, where visual arts have always flirted with the limits of reality. In the eighties, Michel Botman started exploring the first tools to manipulate images though computers. For about 15 years, Michel Botman worked throughout Europe in the emerging field of Computer Applications for the Graphic Arts. Extensive experience in Digital Imaging allowed Michel to move into the field of computerized systems for Diagnostic Imaging. As VP Sales & Marketing for eSys Medical and later with Eclipsys, Michel Botman always remained dedicated to the creativity and innovation that are at the heart of his career. At the present time, Michel Botman is refocusing his life towards graphic arts. “I studied photography in Europe, but never had time to practice it enough. Life took me on other paths towards computer technologies and running a business. I enjoyed it very much, but I also love art. I always keep my eyes open for exciting opportunities and people that touch my heart.” Michel Botman currently lives in Toronto, Canada. Above Gravatar pictures are of Michel Botman, his wife Lindy Amato and his son Noah Botman. This entry was posted in Family, Israel / Judaism, Noah Botman, Travel and tagged Claire Sonsol, Holocaust, Isidore Sonsol, Israel, Jews of Rodes, Jews of Rodos, Judaism, Ketty Amato, Ketty Codron, Laura Codron, Laura Codron Stockholm, Leon Codron, March of the living Poland, Maurice Codron, Meri Codron, Mousani Codron, Noah Botman, Noah Botman Israel, Noah Botman Rodes, Noah Botman Rodos, Noah Botman Yad Vashem, Perla Levi, Rivca Codron, Rodos, Yad Vashem. Bookmark the permalink.